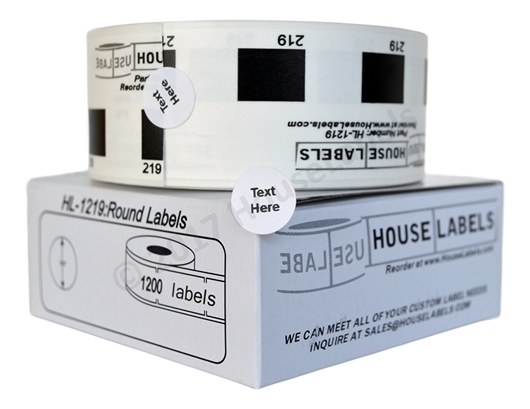 BROTHER-Compatible DK-1219 Small Round Labels (Diameter 1/2" / 12mm; 1200 Labels per Roll) -- BPA Free! 12 Rolls of BROTHER-Compatible DK-1219 Small Round Labels (Diameter 1/2" / 12mm; 1200 Labels per Roll) -- BPA Free! 36 Rolls of BROTHER-Compatible DK-1219 Small Round Labels (Diameter 1/2" / 12mm; 1200 Labels per Roll) -- BPA Free! 56 Rolls of BROTHER-Compatible DK-1219 Small Round Labels (Diameter 1/2" / 12mm; 1200 Labels per Roll) -- BPA Free! 100 Rolls of BROTHER-Compatible DK-1219 Small Round Labels (Diameter 1/2" / 12mm; 1200 Labels per Roll) -- BPA Free!